One thing that attracts people to golf is the opportunity to enjoy beautiful weather. A sunny day, where there is just a few clouds and a cool breeze is the perfect atmosphere for a round of golf. But what happens when unexpectedly a storm comes along and you still have a few holes to go? Any amount of rain and heavy winds can impact your game and turn a great round into a miserable one. A great golf umbrella can keep you dry on a rainy, gusty day and is an important accessory that every golfer should own to protect themselves and their clubs from rough climate. You would assume that buying something as simple as an umbrella would be easy, but that isn’t the case. It’s not that umbrellas are complicated themselves, it’s the overwhelming bombardment of available options. Taking the time to learn the key components that make a great golf umbrella will have it’s benefits. To simplify the process of purchasing a quality golf umbrella, we have composed a list of our favorites. Why Do You Need a Golf Umbrella? What makes an umbrella a golf umbrella are a few key points that assist with making your round of golf a pleasurable experience despite the bad weather conditions. Ordinary umbrellas typically have a single layer, which won’t function well during a windy day. The gust of wind will catch the underside of the canopy and practically pull it from your hand. However, golf umbrellas utilize a double layer canopy, providing a spot to insert vents between the layers. These vents allow the wind to pass through the canopy effectively without pulling it out of your hand. Secondly, golf umbrellas are usually larger which means they’re not only used to keep the player dry, but to also offer the comfort of shade on a blistering hot day. Despite being a simple accessory, purchasing a golf umbrella can be a confusing task for many players. There are numerous styles of golf umbrellas that are sold on the market today. 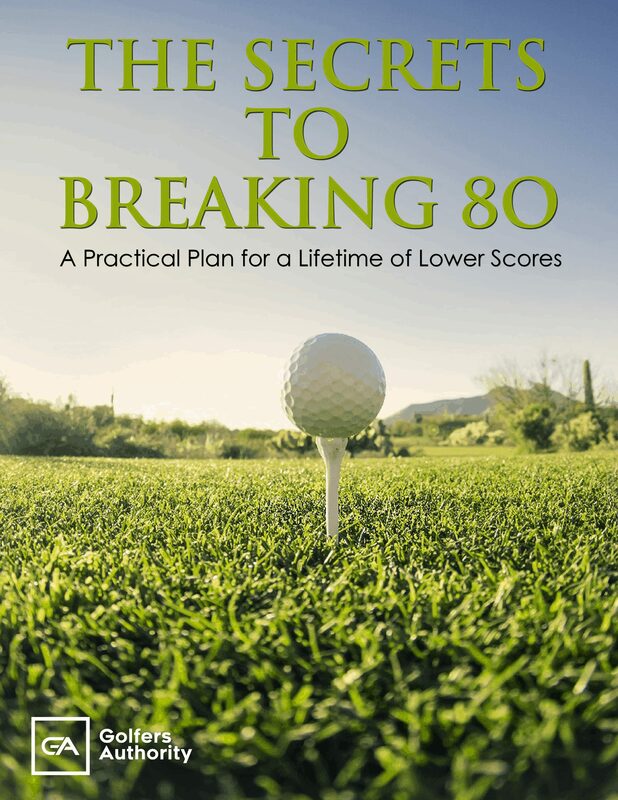 Choosing the wrong one not only wastes your time and money but also disturbs a player’s golfing ability. Choosing one of the best golf umbrellas ensures protection from the harsh weather and a better experience. Key points to look for vary from the diameter of the canopy to the comfort of the handle. Golf umbrellas are usually larger in size to offer more protection for the player. Even though a 25-inch long umbrella can be labeled a golf umbrella, there are other sizes that function better. Longer sizes like 27-inch and up to 34-inch are more commonly used. The diameter of a golf umbrella should be somewhere in the 60-65 inches range to achieve the most coverage. There are a few umbrellas that reach up to 70 inches but may be harder to carry when needed. Finally, the part of the canopy you will want to examine is the number of ribs that support the canopy. There are 16-ribbed and 24-ribbed golf umbrellas, the number of ribs is determined by the size of the canopy. The weight of a golf umbrella is very important due to its size. It must be lighter so that it’s easier for the player to use. Making the umbrella lightweight makes it effortless to carry everywhere. The optimal weight of a quality golf umbrella is about 1-2 ounces for portability. This weight is sturdy enough to deal with heavy weather and still be comfortable to hold for a period of time. The materials used in the creation of the golf umbrella influences the quality, durability, and functionality of the golf umbrella. Golf umbrellas are usually produced using a special nylon that is both waterproof and anti UV. 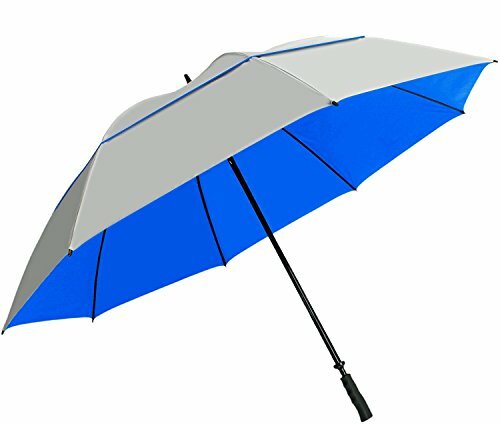 It’s common for golf umbrellas to use fiberglass for the handles and shafts. Using these strong materials will give it the strength, stability, and durability a player needs. The golf umbrella must be able to withstand a significant amount of wind. Harsh winds already impact your game, so choosing a wind resistant golf umbrella will give you the opportunity to focus more on your game. We’ve all seen an umbrella bend from a strong gust of wind. To prevent this, most manufacturers test their golf umbrellas to withstand wind to at least 50 mph. Throughout the years the golf umbrella has been designed with other details that make it more resilient. Important parts like canopies that are sloped for fluid air movement and vents are just a couple. Below we list our top favorites of the best golf umbrellas on the market today. 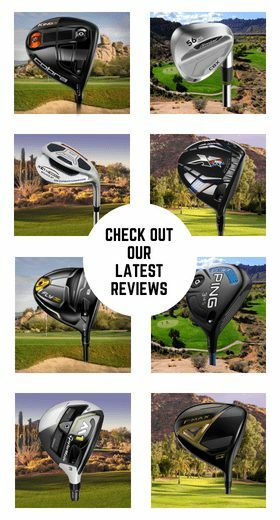 Over the years TaylorMade has researched and improved numerous golf accessories. One of its most popular accessories for Tour players is its Double Canopy Umbrella. This is the ultimate accessory to handle any weather condition. Featuring Windpro technology cable vents that allow the canopy to withstand close to hurricane forces, despite being 68 inches in diameter. 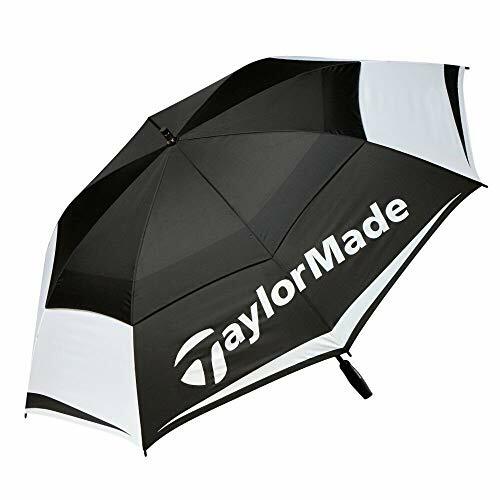 TaylorMade also produced this umbrella with high end materials like the fiberglass frame and a rubber coated sport grip handle. Effective and easy to use, the TaylorMade Double Canopy Umbrella is a great choice for any golfer. While other umbrellas get easily flipped in the wind and break, the EEZ-Y 58-inch Portable Golf Umbrella has the ability to stay strong. First, it includes a vented double canopy that allows the wind to pass through the vents, creating smooth airflow to prevent flipping over and breaking. This canopy stands strong at 50 inches in diameter to provide a large amount of protection. Secondly, you don’t have to sacrifice protection for the convenience of portability. This golf umbrella folds down to 23 inches and weighs in at 1.2 lbs. Making it a smart choice for those who are going to be storing it in their golf bag or car. Lastly, EEZ-Y made sure that this umbrella is easy to use by incorporating a simple button-press to open. This golf umbrella is certain to go beyond expectations, solidifying its place as one of the top golf umbrellas. BAGAIL Golf Umbrella is used by many professionals due to its proven durability and overall effectiveness. This BAGAIL golf umbrella comes equipped with a vented double canopy system. This design provides strength and flexibility by flexing with the wind, allowing it to maintain its shape. For rain, the water resistant canopy was created with a silk derived material that also provides SPF 50+ protection. The ergonomic handle with a comfort grip helps keep the umbrella secure and is where the automatic opening button is located. BAGAIL stands behind the durability of this golf umbrella, making it a strong contender in our list. 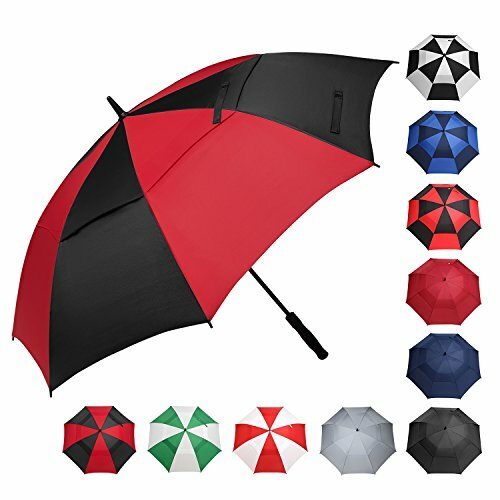 PROFESSIONAL GOLF UMBRELLA: BAGAIL Golf Umbrella is used by many golfing professionals due to its durability and effectiveness. The Bagail golf umbrella is equipped with a vented double canopy, rubberized comfort grip handle, and auto open mechanism. WATERPROOF & SUNPROOF FABRIC: The water resistant canopy uses 190T pongee micro-weave fabric. This silk derived material is ultra water resistant with SPF 50+ protection (blocks 99.95% of sunrays).On top of that, it's light in weight and very fast to dry. FIGHTS THE STORMY WEATHER: The vented double-canopy design adds strength and flexibility. The solid framework underneath flexes with the wind so that the umbrella keeps its shape The fiberglass ribs, hub and shaft do no conduct electricity, so you can safely use this umbrella in stormy weather throughout the course. Dealing with poor weather isn’t fun, so staying dry is essential to make the best of it. 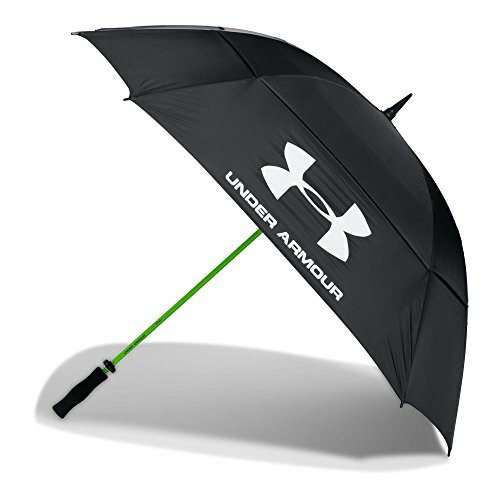 Luckily, Under Armour has created a double canopy golf umbrella that can take care of that predicament. Released with UA Storm technology, this canopy has the ability to repel water and block the wind. 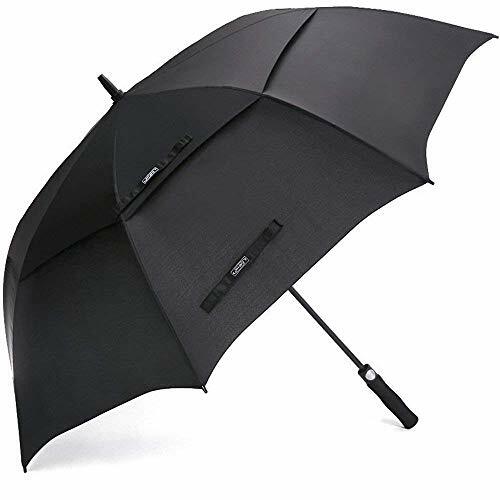 For convenience this umbrella comes equipped with a dual action opening mechanism situated on a textured rubber handle. This setup allows for fast engagement and a secure grip. Expanding to 68 inches in diameter, the UA Double Canopy Golf Umbrella provides unrivaled protection. Third Floor has engineered the Double Canopy Windproof Golf Umbrella to stand the test of time. This large, 62-inch double vented canopy will keep you and up to 3 people comfortably dry. Third Floor brings the best with protection from both rain and sun. The heavy duty frame will maintain its shape in heavy rain and strong winds. This means that your golf umbrella won’t invert like other umbrellas, but instead allows the wind gusts to pass through the vents. Lastly, even though this canopy is large, Third Floor has incorporated an easy, one-hand quick open function. So, if you are looking for an easy to use golf umbrella, the Third Floor Double Canopy Windproof Golf Umbrella is one you don’t want to overlook. WINDPROOF EXTRA-LARGE SPORT UMBRELLA: When we say EXTRA LARGE we mean it! The 68-inch XL double vented canopy on our golf umbrellas will keep you and your closest friends and family dry - Up to 3 people can fit easily! Our high quality heavy duty sport stick umbrellas for golfing, sporting events, and travel are something you should never leave home without! PROTECTION FROM THE ELEMENTS: Stay dry in the harshest conditions that mother nature can bring. Third Floor Umbrellas is bringing you the best umbrella to protect from both rain and sunshine depending on the day. Our heavy duty frame holds its shape in high winds and torrential rains so you can trust our big mens and womens golf umbrella to keep you safe! DOUBLE VENTED WINDPROOF DESIGN: This golf umbrella will not invert like other cheaper models! The double vented canopy design allows wind gusts to pass right through preventing the dreaded umbrella inversion and allowing you to handle even the harshest city streets! Callaway is one of the biggest names in golf. 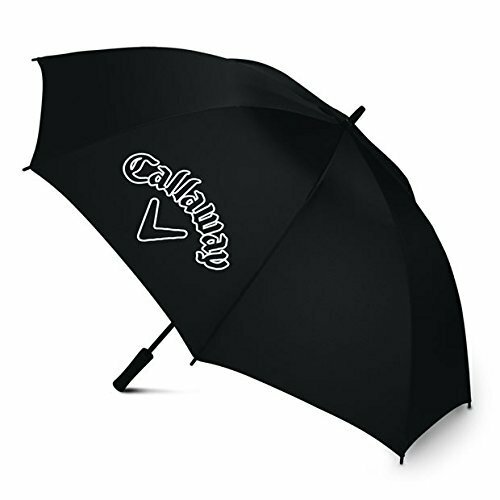 The Callaway Golf Umbrella allows you to play through any poor weather you may encounter. This umbrella features a rugged nylon double canopy, combined with a robust frame and tension cables. This configuration ensues minimal inversion risk and a reliable operation every time you use it. A heavy-duty fiberglass shaft is is situated with a comfortable, non-slip grip to be able to stand up to the elements. 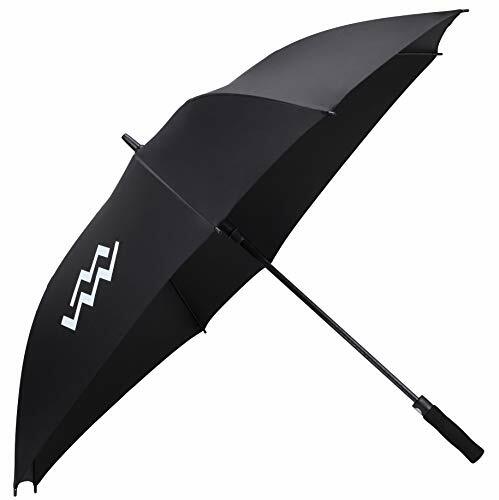 This 60-inch golf umbrella is set with a manual open mechanism for secure engagement and minimal malfunction. 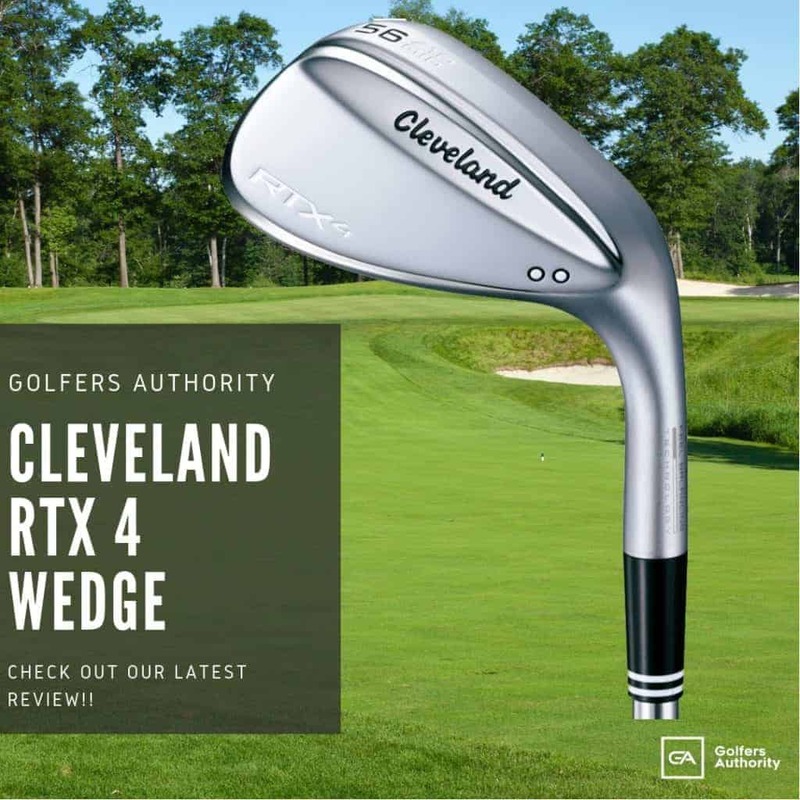 If you are in the market for a golf umbrella that not only delivers function but a classic style, the Callaway Golf Umbrella is a great choice. 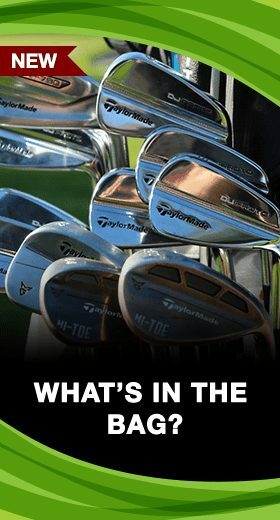 Titleist is a strong competitor in the golf market with its reliable and tested equipment. The Titleist Golf Tour Double Canopy golf umbrella is a fine example of just that. 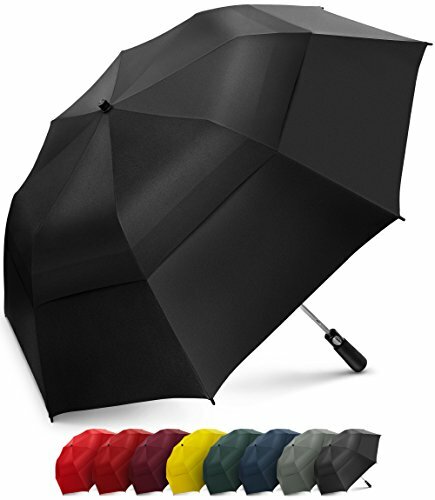 Created to perform in all weather conditions, this golf umbrella consistently provides reliable protection. Researched designs that include a premium anti-inversion system provides maximum coverage during aggressive weather. When you need a break from the sun, this canopy features a unique fabric treatment that provides UV protection from harmful rays. Handling this golf umbrella will be easy with the ergonomic handle that incorporates a hub grip pattern for a secure grip during use. 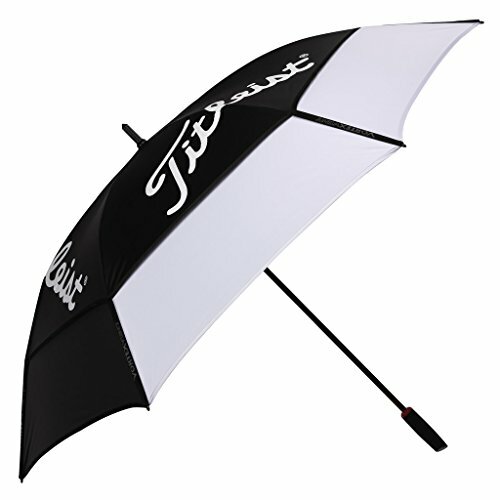 Expanding to 68 inches, this Titleist Golf Tour Double Canopy Umbrella is a fine example of Titleist’s high performance. For those looking for some of the best protection from a golf umbrella, the G4Free Double Canopy Vented Golf Umbrella is one to take a look at. This golf umbrella has been updated with a reinforced fiberglass structure situated with a newer pongee fabric canopy. When opened, this umbrella reaches 62 inches, allowing it to provide coverage for up to three people. When shielding from rain and strong winds, the double vent canopy stands strong allowing wind to pass through and keeping water out. Conveniently made with a durable and lightweight shaft and ribs, you won’t experience any hand fatigues during use. G4Free has also installed a simple button setup to open the canopy quickly instead of getting drenched while trying to do it manually. This G4Free Double Canopy Vented Golf Umbrella is impressive, making it a contender on our favorite list. THE ULTIMATE GOLF UMBRELLA With a 54/62/68-inch canopy and heavy duty design, the G4Free Ultimate Golf Umbrella is an ideal companion for golfers, the business professional or for daily life. With its sleek all black design, comfortable EVA grip, sturdy frame and auto open mechanism, the G4Free Ultimate Golf Umbrella is perfect in a metropolitan city or a sports field! PROTECTS FROM THE ELEMENTS Never get caught in the rain (or sun) again. The G4Free Ultimate Golf Umbrella will protect you from anything that mother nature can throw at you; rain, hail or shine. The canopy uses ultra water resistant 210T pongee fabric. This silk derived material is lightweight, and water resistant with SPF 50+ protection. YOU (WON'T) BE BLOWN AWAY The double-canopy design and fiberglasses frame will ensure that your umbrella is VIRTUALLY WINDPROOF. Wind will simply not break it. The double-canopy design creates a vent during where wind can pass through, making the umbrella much easier to handle in harsh conditions. Mio Marino is bringing a functional and fashionable, modern style golf umbrella with its Mio Marino Windproof Golf Umbrella. A unique EVA sponge and lightweight materials make the handle very comfortable while also being non-slip. With just one click of the button located on the handle, the umbrella will automatically open with little effort. Staying safe and dry no matter the circumstances, comes from a fiberglass rod which protects a player from lightning. The strong ribs have the ability to withstand some of the strongest and intense winds. When the weather turns sunny the canopy also protects you from harmful UV rays. Mio Marino made it a mission to provide players with a reliable golf umbrella and that’s exactly what they did with the Mio Marino Windproof Golf Umbrella. TRENDING NOW - Mio Marino has originated this modern style ultra large umbrella that keeps the entire family protected from rain and shine. 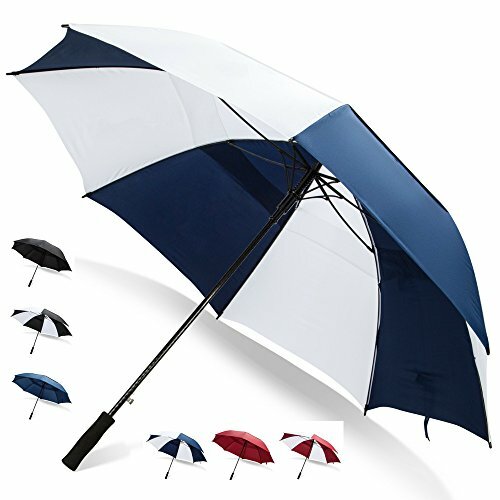 Classy two-tone square-shaped umbrella is an original fashion statement. MODERN FEATURES - Ultra comfortable non-slip handle with ergonomic EVA sponge and lightweight makes this raingear and golf equipment easy to use and easy to operate. Automatic umbrella opens with just one click of a button. WHATEVER THE WEATHER - This umbrella for men and women will keep you safe and sound at all circumstances, fiberglass rod protects against lightning while UV protection against strong sun including strong ribs that withstand the strongest storms and the nastiest winds. It’s accurate to say that Sun Tek is a leader when it comes to protection from nature’s worst conditions. The Sun Tek Windproof golf umbrella offers superior UV protection with a unique silver coating on the canopy. This coating reflects heat to cool you down as well as block 99% of the sun’s harmful UVA and UVB rays with a 50+ UPF rating. This golf umbrella features a Vortec venting system that prevents inversion during high winds while also protecting the player from sun, rain, snow, and even hail. A fiberglass shaft and ribs keep this umbrella lightweight and durable, with the addition of safety during a lightning storm. Expanding to 68 inches in diameter, this umbrella is big enough to shade two people from harmful conditions. If you are in the market for a golf umbrella that offers so much while still fitting into a golf cart umbrella mount, the Sun Tek Windproof Golf Umbrella is an easy choice. 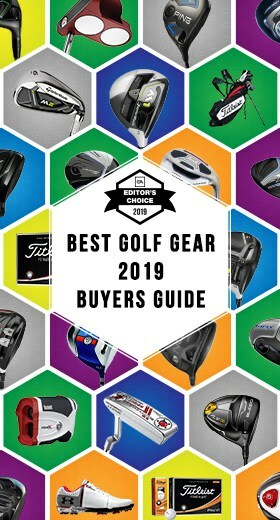 After reading through this buying guide, we hope you were able to grasp the important features of the best golf umbrellas available. While there are hundreds of options available for you, it was our goal to provide you information to make your choice easier.